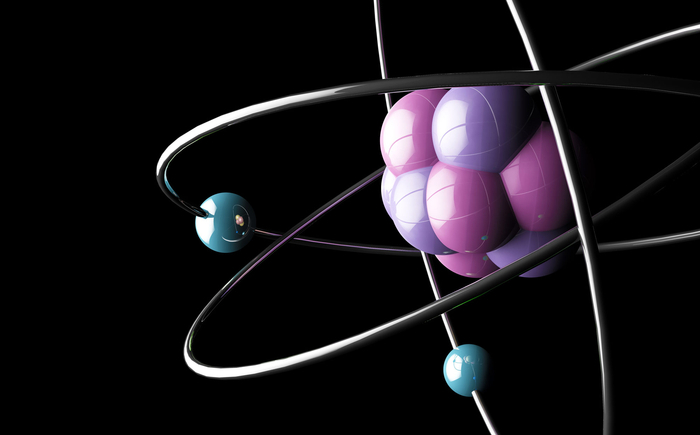 Plasma is a chemically active medium which, according to its activation modalities and power, can generate very high or very low temperatures: in these cases it takes the names of thermal plasma and cold plasma, respectively. This wide temperature range ensures a large application spectrum. The thermal plasma, thanks to the extremely high temperatures it can generate, is widely used in the metal processing industry for cutting and welding operations. The industrial applications for the cold plasma, though very different from each other, are all related to surface modification processes: surface activation, cleaning and coating. For example, a cold plasma treatment makes it possible to generate, on the surface, chemical reactive substances which cannot be obtained with conventional chemical processes. An important benefit is represented by the possibility of performing a treatment involving only the surface layers of the material, without modifying its general mechanical properties and using a low processing temperature which do not damage degradable substrates. This offers a possible solution to many wettability and, as a result, bonding problems posed by some types of polymers, such as for example polyethylene and polypropylene, featuring extremely poor adhesion properties although used in a wide range of applications. All this provides the base for a study aiming at evaluating the effects of a cold plasma treatment on the adhesion properties of polyethylene. The goal is to identify the optimal machine parameters (power and exposure time) in order to ensure the best results in terms of shear strength of the bonded joint. Experimental tests were carried out using special single overlap joints. In particular, the experiments involved: untreated joints degreased with a solvent, joints treated with a primer, and joints treated with plasma with different machine parameters. The goal is to evaluate the shear strength of the joints with cold plasma treated surfaces, and determine the effectiveness of this treatment compared to traditional surface treatment techniques, such as degreasing or the application of special primers and activators. 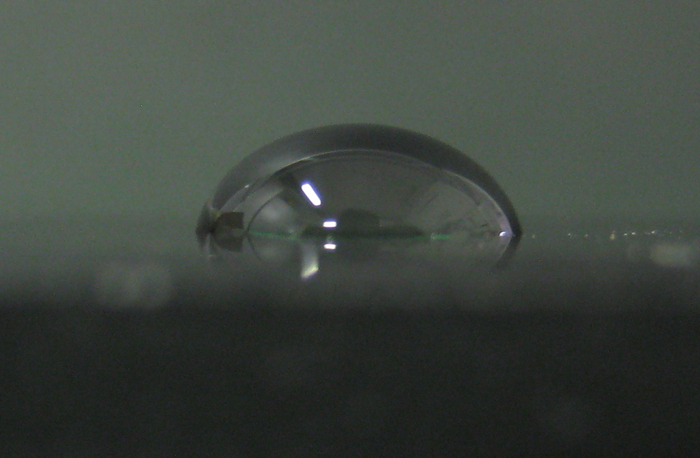 A first significant parameter determining the bonding capacity of a surface is wettability. If the adhesive wets the surface optimally, the interface becomes larger and, as a result, the joint can withstand higher loads. Polyethylene is a low surface energy material and, as a result, it is characterised by very poor wettability; this is why it was decided to perform a number of tests in order to determine the effects of the cold plasma treatment on this parameter. 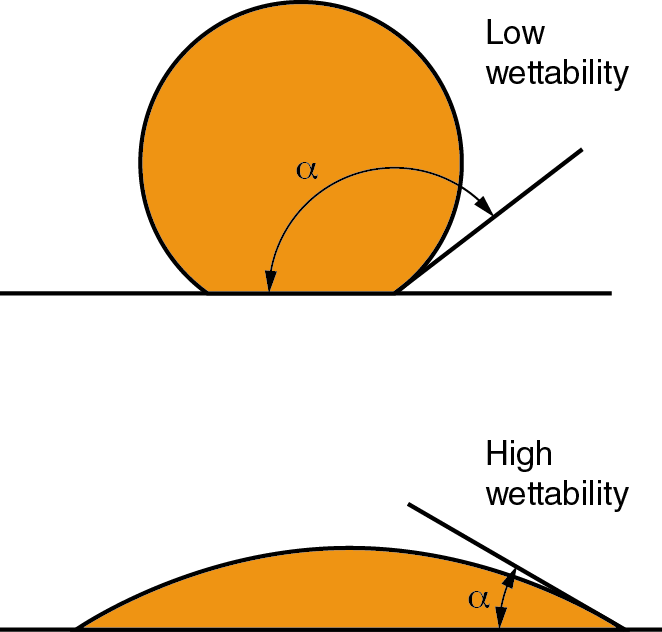 Figure 1 shows wettability as a function of the contact angle. Polyethylene was degreased by means of a solvent and then treated with plasma. 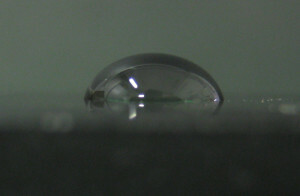 In order to assess its wettability, a drop of demineralised water was placed on the surface, macrographies were performed and, through an image acquisition software, the contact angle (α) between the substrate and the drop was measured. 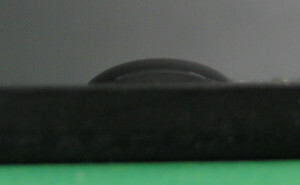 After having completed the research on surface properties, the joints were bonded with Loctite® 401 adhesive, an ethyl cyanoacrylate substance representing the ideal solution to assemble even those materials which are difficult to bond, such as polyethylene; furthermore, a specific primer for this adhesive was applied: the Loctite® 770. The plasma treatment was carried out through a Tucano low pressure cold plasma reactor by Gambetti Kenologia (Italy), using air as process gas. All the joints underwent a surface preparation treatment based on degreasing by means of a cloth soaked with solvent. The first experiment was performed on five single overlap joints degreased only: the results deriving from the lap shear tests of these joints represented a benchmark for the evaluation of possible improvements obtained by using the primer or the plasma. For the successive tests, five joints consisting of primer-treated samples were used as well as many other plasma-treated joints. As regards plasma-treated samples, five repetitions were performed for each time-power combination taken in consideration: every combination was chosen from time to time based on the results obtained previously, stopping once the optimum result was achieved. Table 1 shows the time-power combinations used for the plasma treatment. The strength levels were evaluated by subjecting the bonded joints to shearing stresses, according to the ASTM D 1002 standard, at a constant cross-piece motion speed of 1.3 mm/min. Figure 2 shows the kinds of joint tested and the related typical size. The tests performed highlighted a significant increase in the adhesion properties of the plasma-treated material, corresponding to an improvement in terms of wettability and strength of the bond joints. 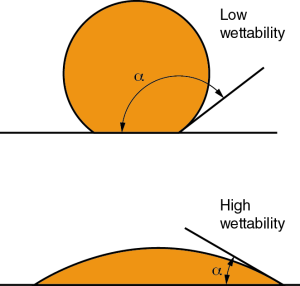 Figure 3 reports the variation of the drop-substrate contact angle as a function of the plasma exposure time at a power of 50 W.
The 0 time point corresponds to the contact angle of the untreated surface. It clearly shows a considerable decrease in the contact angle, resulting in an increase in the polyethylene surface energy even for very short periods of time. This phenomenon is essentially determined by the deep removal of pollutants from the substrate and from the effects of the surface activation triggered by the plasma. For example, figure 4 presents a comparison between the images of the two drops positioned on the untreated substrate (figure 4a) and on a substrate treated with plasma for 60 seconds at a power of 50 W (figure 4b) respectively. Figure 5 presents the development of the joints breaking force as a function of the plasma treatment time at two different power levels. Each point of the curve represents the average strength of the five joints bonded with a certain time-power combination. 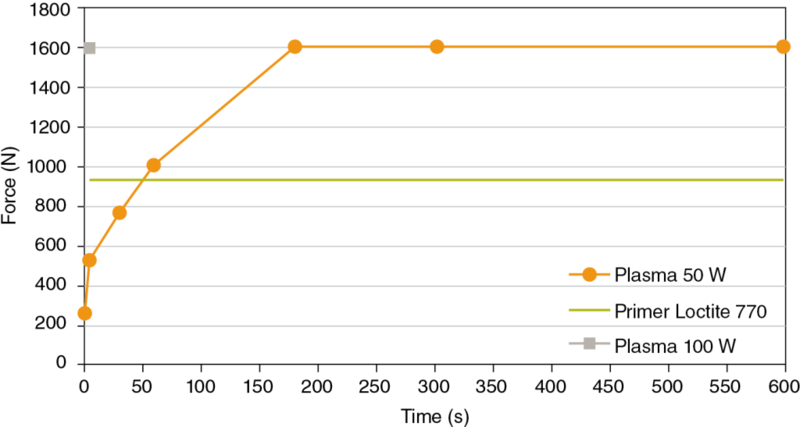 Again, the result related to the 0 time point corresponds to the average force which broke untreated joints. 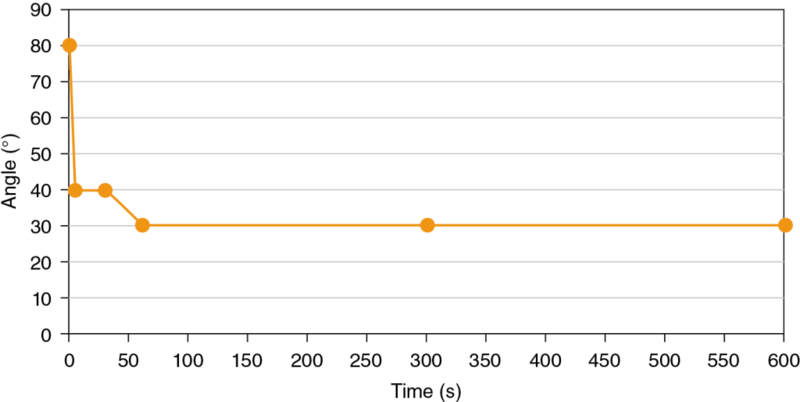 The horizontal line represents the average force which broke the five primer-treated joints. The test results are clearly satisfying: a plasma treatment of 60 seconds at 50 W allows the load limit obtained with the primer treatment to be exceeded. It is important to underline that the asymptotic value reported in figure 5 (1600 N) does not derives from the joint break, but from the strength of the substrate material, which can be elongated to such an extent that the test is completed without breaks. The tests showed that, by increasing the power to 100 W, extremely short treatment times (5 seconds) are sufficient to reach the load generating the substrates macroscopic deformation. Based on the results obtained, it was decided that new tests with longer treatment times were not necessary. On an operational level, it has been observed that the primer causes a substantial reduction of the piece handling time after the bonding process. 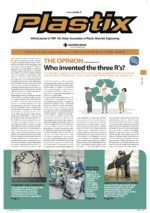 The primer, in this case, also acts like an activator, thus making the bonding of the adhesive substances almost immediate: a fact that turns out to be particularly important for manual applications and in case of high production volumes. • by treating the surfaces with a specific primer with activator effect, it is possible to reduce the handling time and ensure a quick fastening of the substrates without the need for any support equipment. All of this confirms the necessity of a correct surface preparation when high-strength joints are required, and the validity of the plasma treatment as an alternative to the use of primers when bonding low surface energy materials. The authors would like to thank Gambetti Kenologia Srl for the plasma reactor, and Henkel Italia SpA for the materials used in this study.